Sell old Euro coins and pre-Euros coins and notes for CASH. There are many thousands of people with pockets full of euro coins that they can’t exchange at a bank or bureau de change. This is because of the huge costs that the banks incur in counting and sorting Euro coins and then shipping them back to the country of origin – so you end up with leftover Euro coins from your holidays and business trips that go to waste. However, if you want to sell old Euro coins then there is at last a solution – Cash 4 Coins. We exchange old Euro coins that you want to sell and our service is fast, simple and secure and we offer a 100% satisfaction guarantee! You simply send us your old Euro coins – we’ll even collect for FREE over certain weights so see full details on the page ‘how to send us coins‘. We then sort and count your Euro coins and pay you! It really is that simple. This is why we are the first port of call to sell old Euro coins. Just think of the spare cash that you can now realise by simply sending to us. The great news is that if you don’t accept our offer we’ll return your coins FREE of charge so there is no risk. So, don’t go hunting around for things you’ll never use in Duty Free just because you need to use up your leftover euro notes and coins. Bring them home and then send them to Cash4Coins. We offer expert valuable services and can give you a great price for your currency. We give you the service that your bank can’t and we would be delighted to help you transform your useless foreign currency into something you can use right now. It’s really never been easier to sell old euro coins and if you have any questions about the process we have the answers. It really is as simple as sending us the coins, waiting for your valuation and then accepting if you are happy. You don’t need to count or sort your coins and you don’t have to accept our valuation. If you are not happy (but we think you will be!) simply let us know and we will get your coins back to you completely FREE of charge! These are just a few reasons why we are the UKs favourite Euro coin exchange brand – check out our customer comments page to see what our customers say about our service. We are trusted by banks, hospitals, schools, charities, businesses and individuals across the UK. 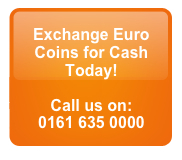 If you’d like to sell your old Euro coins then contact us. We can help you organise an effective collection and over loads of advice to make yours a big success. We help private individuals, companies, schools, clubs and charities raise much needed funds so don’t miss out – sell old Euro coins to us here at Cash 4 Coins today!